In a recent ICAEW report Artificial intelligence and the future of accountancy, Kirstin Gillon, from ICAEW’s IT Faculty, looks at the rise of artificial intelligence, its impact on the accountancy profession and how it can be utilised by accountants. Artificial intelligence systems can be very powerful and are improving quickly. They provide outputs that can be extremely accurate, replacing and, in some cases, far superseding human efforts. However, they do not replicate human intelligence. We need to recognise the strengths and limits of this different form of intelligence, and build understanding of the best ways for humans and computers to work together. ICAEW has started exploring the use of artificial intelligence to improve existing services for its members and other audiences. You can now have a conversation with the ICAEW AI assistant. It’s trained to answer questions on the impact of artificial intelligence on the future of accountancy, and can also tell you a little about ICAEW, general AI questions and about itself. It’s in Beta mode at the moment and all interactions will help ICAEW improve its machine learning capabilities. The process of developing this bot, and the data gathered through interactions, is intended to provide increased learning and understanding in this relatively new digital platform. Please leave feedback on your experience of ICAEW’s AI assistant on icaew.com. Although artificial intelligence techniques such as machine learning are not new, and the pace of change is fast, widespread adoption in business and accounting is still in early stages. To build a positive vision of the future, we need to develop a deep understanding of how artificial intelligence can solve accounting and business problems, the practical challenges and the skills accountants need to work alongside intelligent systems. 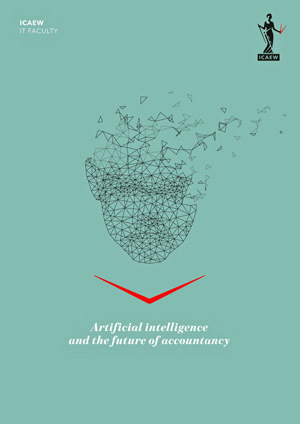 ICAEW has long-standing expertise in technology-related issues, drawing on the experience across many aspects of business, finance and accounting, and will focus on building understanding of the practical use of artificial intelligence across business and accounting activities today and in the near future. Watch the recording of IT Faculty’s event Artificial intelligence – what does it mean for the future of accountancy?, in which artificial intelligence expert Professor Moshe Vardi discusses the growth of artificial intelligence and its impact on the accounting profession. You can download the full report on artificial intelligence and the future of accountancy here. You can read more about AI on icaew.com.